Automatic Gear Problems: The transmission in your vehicle is the part of the car that directs the power from your engine to the driveshaft which in turn helps to turn the wheels on your vehicle. 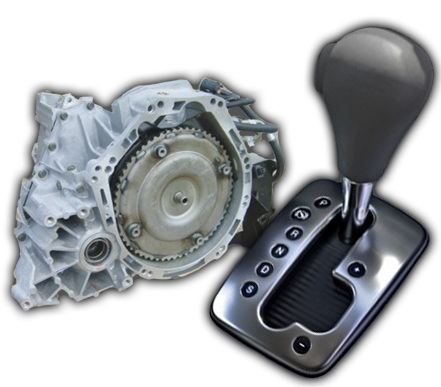 An automatic transmission (also called automatic gearbox) is a type of motor vehicle transmission that can automatically change gear ratios as the vehicle moves, freeing the driver from having to shift gears manually. Many new transmissions are electronically controlled. On these models, electrical solenoids are used to better control the hydraulic fluid. Usually, the solenoids are regulated by an electronic control module. If the transmission is slipping, it can feel like you are driving in a certain gear and then it changes for no apparent reason. The noise from the engine may change in pitch or start to sound like whining. Your car may feel like it is refusing to change gears as it normally does, or the gear shifts are not very smooth. Sometimes you can feel or hear a noticeable shaking. You may also notice the car has difficultly getting up to speed. If this symptom occurs, you will notice a delay before the car actually engages into drive and starts moving forward. When you shift out of “P” and into “D,” there may be a long pause where the car revs the engine as you accelerate it, but it is not moving forward as it should. Transmissions are generally sealed units that should never leak fluid. If you have noticed leak spots on your driveway or garage floor, lay down cardboard under your car in the front and middle to determine if they are active leaks. A warning light alone, like the “check engine” light, typically doesn’t mean you have a transmission problem, but if any of the above symptoms are occurring in conjunction with an illuminated warning, have it diagnosed by a professional. A warning light typically means the computer is generating an error code that can be checked with a shop’s diagnostic equipment. For transmissions specifically, “P0700” is a code that can indicate a general transmission problem. Any burning smell coming from your car is a cause for concern. Overheating transmission fluid is one of the causes of a burning smell. Transmission fluid helps keep the parts lubricated and cooled so that they do not get worn out and damaged. If the fluid breaks down, the system runs too hot which it results in increased friction and corrosive activity as well as the build up of additional sludge and debris. Luckily, a transmission that is noisy when it is in neutral could have an inexpensive, simple solution such as adding some fluid or changing it. If that doesn’t work, the transmission may require professional attention to replace worn out parts, most commonly the bearings, worn gear teeth or the reverse idler gear.